Guyancourt, the 13th of July 2017. Pricer, the leader of electronic shelf label digital solutions, is helping the Varennes-Vauzelles store to digitize its point of sale. 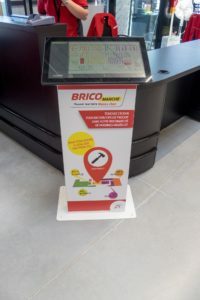 It is the first Bricomarché to have equipped its store with a kiosk for its customers to easily find on the shop floor the products they are looking for. After having dominated food retail, store digitization projects have seriously increased in the DIY industry. With the emergence of pure players in 2013 and their quick growth, DIY retailers have been spurred into modernizing their stores by making them more innovative, connected, agile and interactive. Bricomarché Varennes-Vauzelles seized the opportunity of opening a new store of 7000 square meters to implement an ESL solution to carry out an omnichannel and flexible price policy. The objective was to easily and quickly update their prices according to price modifications of their local and web competitors. The most outstanding innovation is the web based customer application available on a kiosk situated at the entrance of the store or on any smartphone. This application enables shoppers to locate on the store’s digital map the products they are looking for. With a 3-year experience of implementing kiosks for DIY leaders, Pricer is the sole supplier capable of automatically positioning products. This solution, called Pricer Search, is built on the Infrared communication infrastructure used by the electronic labels implemented in the Varennes-Vauzelles store. Geopositioning relies on Infrared trilateration (IR): each label is bidirectional and replies to Pricer’s communication platform with different signal strengths providing their positioning and therefore the location of the products in the store. Pricer has won the Paris Retail Awards 2016 in the Customer Experience category (360) with its Automated Product Positioning solution. Pricer has won the RETA (Retail Technology Award) Europe in the Best Customer Experience category with its Automated Product Positioning solution. Pricer AB, founded in Sweden in 1991, listed on the NASDAQ OMX Nordic, is the global leader in providing in-store shelf-edge digital solutions that enhance both store performance and the shopping experience. The increasingly feature-rich Pricer platform is crossing over to solve key store transformation challenges such as customer and employee guidance, task-to-light and order preparation. It is also evolving to support shelf-edge customer personalization, data capture and interpretation. Pricer works with the world’s top retailers, small and large alike: grocers, DIY, electronics and specialty stores. To date, Pricer has sold more than 140 million electronic shelf labels to 15,000 stores in over 50 countries.